Day of rest. Fast Sunday. Went to church. Usual runs for everybody. A bit more distance for me. Joseph ran early - was headed out to Bear Lake for the scout camp. Julia did her 3 miles OK finishing in 7:38 uphill and a total time of 23:24. With William - part with Stephen, part with Jenny. Kids ran their usual distances on their own today. I did a workout - warm up to the Press Building, then an out and back tempo 10 mile tempo on the trail (5 up/5 down), then back to the house. Total time was 1:00:50 (6:05 average). This was a tough workout and I did it out of plain fear. I am getting older. In some ways my memory is getting worse, but I am able to see a larger time span as a whole and evaluate some things with a better perspective. So I vividly remembered what the last 10 K of Top of Utah feels like and wanted to be prepared for it. I also vividly remembered that when I am not yet fit, going over 20 for the long run makes me even less fit, and so does a longer than 10 mile tempo. So I decided to do a mid-week 10 mile tempo, something I had not done in a while. Logistically I could not make it happen without doing half of it uphill. I was reluctant but I just bit the bullet and went for it. Total of 10.5. Paced Sarah through 2 miles down the canyon in 14:57.8 (7:41,7:16) - her first time under 15:00 on that course. Then ran some more distance. Kids ran mostly on their own except I ran with Jacob (5) and Matthew. Joseph was at the Bear Lake, I assume he ran there. Matthew set a new PR in 800 on the track without the holding the hand - 4:01.7. His splits by 100 were 26,29(55),29,32(1:56),28,34(2:58),30,33. He has matured a lot emotionally in the last 4 months, and was emotionally steady most of the way except for the occasional rough patches from which he was able to recover - except for the rough patch in the last 100 meters. Compared to 4 months ago this is night and day - back then he would lose it around 200 meters in a 400 and never recover. In terms of talent, he might be our first sub-8:00 miler before turning 5. However, this will depend on how he will mature emotionally in the next few months. With Jacob to the car. Did a workout with Jacob 2x1000 down the canyon with 400 recovery (3:20.9/3:19.4), then ran more distance to make it 10 with 2000 in 6:38.8 down the canyon at the end. Otherwise, usual distances for the kids, except Jenny ran only 5 miles due to some fatigue. Total of a little more than 10.5 for me. Joseph ran at the scout camp. William did 4. Workout with Jacob. William ran alongside as well but did not do the workout except for the first quarter. Matthew - false start. Forgot to go to the bathroom. With Matthew for real this time. Usual runs with the kids today, except William did 4, and Jenny also did 4 to be fresh for the Uneventful Provo River Half tomorrow. With Jacob. Last 2 K with Tyson Lambert from UVU. 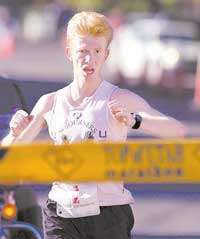 Paced Jenny through the Uneventful Provo River Half in 1:33:53. She held on quite well up until 10 miles keeping up around 7:00 and sometimes hitting sub-7:00 on downhill miles. Her uphill mile was 7:43. After 10 she started experiencing cramps, but did not crash too badly running 7:15 at first and then 7:30 towards the end. Overall a confidence builder for her. I was just hoping she could start at 7:30 and keep it through the first half, then slow down to 8:00 or so. She was very sore afterwards, but that was expected. So this goes to show that someone who runs six days a week for 6 miles a day and has never run more than 7 at once can run a respectable half (relative to the 5 K speed). Definitely better endurance/pace persistence than what I have seen from people who occasionally run 13+, but do not run consistent daily mileage. Afterwards I paced Sarah through a 7:19 mile down the canyon, and ran a 4 mile tempo - 1 mile up, 3 down, splits 6:07,5:49,5:43,5:41. It started getting warm towards the end, plus I had a lot of miles on the odometer, so it was tough. Total of 20. Two triangles at the Vivian Park. Letter S at the start of the old highway. Mark "16" on the old highway. One triangle by the gate at Nunn's Park. One triangle by the pedestrian bridge at the mouth of the canyon. Looking for the "getaway" car. I had to run earlier today to get the run done before the work meeting. Jenny could not run, actually she could barely walk, but she was able to ride a bike. She rode 10 miles with me. I had to push her on a few uphills as she did not have enough quad strength to pedal up. Other kids ran their usual distances on their own. I ran 0.5 with Matthew in the evening. Total of 10. Stephen did a mile time trial. I hoped he would break 7:00. He did run a PR - 7:08.4 (1:41, 1:48, 1:49, 1:47), but mentally was not there for the sub-7:00. He complained the pace was too fast, and tried to start crying a few times, but Jacob and William laid down the law for him and to some extend he was able to control himself. However, he lost some precious time and energy on this. Sarah ran 800 in 3:35 (1:43/1:52). I ran with most of the remaining kids. Did a medium long run with a 10 mile tempo up and down the canyon. Splits: 6:19, 6:15, 6:24, 6:41, 6:25 (32:04), 5:46, 5:44, 5:43, 5:45, 5:38. There was a strong headwind going up, stronger than last week, thus a slower split on the way up, and faster on the way down. Overall, though, I think I was stronger. During the cool down I ran into Julia and turned around to run some extra with her. She ran the last uphill mile in 7:26, which is a positive. Also ran with Matthew in the evening. Otherwise kids ran on their own. Cool-down - part with Julia. Did a workout with Jacob - 2x1000 down the canyon with 200 recovery. He was able to run 3:22.6/3:23.9. Next step is the mile time trial on the track next week. Then ran with most of the rest of the kids. Total of around 12. Workout with Jacob - 2x1000 down the canyon. Did a workout with Joseph - 2x1000 with 400 recovery down the canyon. Then ran 6 with Jacob to get the car + extra distance. Ran with Matthew in the evening. We had a funny incident. Half way through he said he needed to go to the bathroom but his best option was to run home. He did not like it and started to scream and he is loud. In spite of that he kept running at about 9:10 pace and did not insist on holding the hand. He made it hope. I think this is a good development. Workout with Joseph - 2x1000 with 400 recovery. Today Stephen broke 7:00 for the first time with 6:56.0. We have a challenge in the family to break 7:00 before turning 7. Stephen in his typical style made it by this skin of his teeth - 3 days before his 7th birthday, and with the help of 46 seconds in the last 200. His splits were 1:40, 1:47, 1:46, and 1:40 (54,46). Sarah scared him in the first 400, then the pace was too fast for her and she finished the mile in 7:29.9. I did some more running with the kids and then did my workout finishing the total of 20 with a 6 mile tempo down the canyon from 12 to 18 in 34:55. It got warm, pretty close to 90F by then. So I stopped twice in the middle of it for water and to soak my shirt. Thought I might have fuel issues at the start of the tempo as breaking 6:00 felt hard, but I was OK. Paced Stephen, then went back to Sarah and William. With Matthew for real this time in the evening. Day of rest. Went to church as usual. In the morning did the usual runs with the kids. Did a quarter pickup in 79 at the end and it felt easier than I expected. In the evening paced Sarah through 100 in 21.0 and ran with Matthew. He actually ran a 400 PR in the first lap (1:53) but then faded to 2:10 and did not get his 800 record. With Jacob. William did 3, Stephen 2.04. Sarah's 100 time trial. Matthew jumped in, so we timed him as well. Kids ran on their own today. I did 10.54 with a 3 mile tempo down the canyon in 16:28 (5:27, 5:31, 5:30). We had mile time trials today. First William ran a huge PR of 6:01.9 with the splits of 86,89,94,90. I paced him. Then Jacob ran 5:33.8 with the splits of 80,85,83,83. Joseph and I paced him. I kicked for 200 with a lap to go with the idea to help Joseph break his record of 5:28, but he did not follow me, so I eased off. I ended up with 5:30.7, he had 5:32.9. Also Matthew ran 800 PR in 3:58.4 paced by Joseph and Zachary (cousin). Then I ran some more distance alone. In the evening we paced Samantha (the one living with us, not Jeff's wife) through a mile in 10:05 with 2 breaks. Paced Samantha with the boys. Today Stephen set a course record for the 2.04 course - 16:09. Matthew also set the course record for his 0.5 course - 4:00.9. Otherwise it was a usual day. With Jacob and Jeff McClellan. With William. Stephen, Zachary, and Jeff ran the first 2. Part alone, part with Joseph. Mini-taper for the TOU Half. Did a pickup with Jeff in the last 0.44 at about 5:20 pace uphill. Was surprised that I could even do it. With the kids and Jeff. Top of Utah Half, 1:15:24, 12th overall, 2nd master, $75. Started out with Nan and Jacob Kuntz, but could only keep up for a little over 3 miles. Then Dennis caught up to me. I latched on. Matt Wolpert passed us. When we got to the steeper downhill between 5 and 7 I found another gear, passed Dennis, then passed Jacob and Matt, and tried to catch up to Nan. Started to run out of juice as it flattened out. Matt passed me shortly after 9. Right before he passed me my Croc fell off. Not sure why. I lost about 5 seconds and was not able to latch on. However, shortly after 10 John Coyle passed me and I latched on. He pulled me up to Matt by 12, but as soon as we were about to make contact, I fell apart and could not keep the pace. John passed Matt, but I could not even make contact. So I stayed a few seconds behind him for the rest of the race. He won the masters with 1:15:18. Dennis took 3rd in the masters with 1:16:39 (55 years old). Nan's 1:14:34 was not only the course record, but probably the world record for a mother of four (defined as someone who has given birth to and is currently raising four or more children). Nancy Kiprop ran 2:24:20 marathon in Vienna. She has seven children, but she adopted five of them, which puts her in a different division. Aaron Fletcher got the course record as well. Something odd happened in the last 5 K. All competitors around me including myself appeared to have an unusual slowdown. Looking at the split at 9 miles/finish time for me: 2017: 50:41/1:15:24, 2016: 50:47/1:14:49, 2015: 50:43/1:15:04, 2014: 50:47/1:14:46, 2013: 50:21/1:14:49. The Croc incident happened after 9 and cost me maybe 5 seconds, but where did the rest of it go? The time should have been at least 20 seconds faster, even counting the incident. Matt Wolpert had a faster split at 9 than he did last year, had no Croc incident, and finished 35 seconds slower. Nan had about 30 seconds on me shortly after 9 at the spot of the Croc incident - pre-incident. So 5 seconds on the incident, the remaining 15 on just being more fit. John Coyle is an outlier with an unusually fast last mile, but that is to be expected from a 1:06 guy out of shape (or doing a training run, but he looked too fat for a 1:06 guy from behind, so I am assuming just out of shape). Removing the outlier, Matt, Nan, and I ran more or less the same relative to each other comparing the first 10 miles and the last 3, and yet there was a clear slowdown for me and Matt relative to last year (and other years for me). My best explanation so far is that it got a bit warmer, warm enough to where you slow down by 7 seconds per mile or so without noticing. Warm-up with Nan Kennard and Jessica Stanford. Cool-down with Joseph and Jacob. Nan, the Richardsons, and Merillee Blackham joined us for the the first 4. Usual runs, except for William who ran a PR for the 3 mile course in 20:55 (7:03, 6:58, 6:54). Julia also had a strong closing mile in 7:05. Part alone, part with Julia. Ran the first 2.27 with Jenny, then did 4x(4x400) with 200 recovery between intervals and a bit over a mile recovery between sets. First set was up the canyon, the remaining 3 were down. Averaged around 83 on the way up, and 75 on the way down. Kids ran their usual distances on their own. Today we did time trials on the track. Matthew set a new family record in the mile in the 4 and under age division running 8:19.4. His splits were 1:56, 2:03, 2:10, and 2:07. He has experienced a maturity breakthrough - he never cried or tried to stop. This allowed him to improve his previous best by 44 seconds. He still has a lot of potential in the area of focus - he made a lot of surges that lasted around 100 meters followed by a slump with the pace being around 8:00 during the surge and dropping to 9:00 during the slump. Matthew will be 5 on Dec 26th. So far it appears he will be our first sub-8:00 before turning 5. Stephen had the previous family record in the 4 and under division of 8:29. William raced Julia in the 800. She was able to stay with him up to about 300, then had a huge slump. William ended up with a PR of 2:51.1 (40,42,46,43). Julia finished in 3:01.4. I am suspecting she is not absorbing the iron she is taking or maybe just not taking enough. Another possible issue is that she grew vertically very fast, but her heart might have fallen behind. Stephen tried 800 but after the first lap in 1:39 (48,51) and no effort to speed up I stopped him shortly before the 500 mark and had him redeem himself in the 400 which he ran in 89.6 (45,44) breaking 90 for the first time. Joseph, Jacob, and I also paced Kosuke, a Japanese student living at our house for a month to a 6:28 mile. His splits were 86,1:39,1:45, 1:35. Then all of us ran whatever distances we needed to get our standard totals. Pacing Matthew with Joseph and Jacob. Pacing Kosuke with Joseph and Jacob. Paced Sarah on the track today. The target was 7:30 in the mile. She was almost on pace after three laps but kept running 5-10 feet behind me. After three laps I stopped her and told her we had to try again. Slower pace would be fine, but she had to learn to keep contact. While she rested I paced Joseph in his mile time trial. He was not feeling quite 100% and wanted to stop after the first lap which I paced in 78. I told him he had to finish 2 laps. He sped up. I told him if he had the juice to speed up he should finish the mile. He did not quite get the mile record, but was close - 5:30.5. I kicked in the last lap to be a target for him to break the record and ended up with 5:27. Then Jenny and I paced Sarah through a 7:57 mile with the goal being learning to stay in contact with the pacer. She was able to do it this time. Then I ran 2 with Jenny and 5 more alone. Jacob had a stomach bug and ran only 2 today. Otherwise kids ran their usual distances. Pacing Sarah for most of this, then jogged to finish the mile.